The works of Azerbaijani artist Vugar Muradov are showcased at Miami River Art Fair - 2018 on December 3-5. Over the past years, Vugar Muradov has successfully participated at major international exhibitions and art fairs. For example, last year his paintings were sent to the prestigious art fair in the United States. 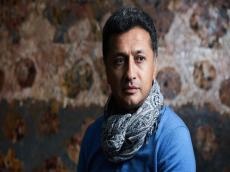 Muradov became the only Azerbaijani artist whose paintings were displayed at Art Basel Miami Beach 2017, the most extensive international exhibition of contemporary art in North America, Yenicag reported. Last year, Art Basel Miami Beach attracted more than 77,000 art dealers, artists, collectors and art lovers. Art Basel is the only fair held at the Miami Beach Convention Center. This time the works of the Azerbaijani artist are presented at the prestigious fair of modern art in Miami, which is annually visited by the most famous art dealers, art agents, gallery owners, art lovers and connoisseurs. Art lovers can enjoy the works of national artist until December 5. Muradov usually says that he has everything that an artist could want: plentiful light suffusing the space through a glass wall and an open view across a bay in the Caspian to a cascade of oil derricks on the horizon. Standing guard over the district for more than a century, they evoke romantic thoughts and feelings. His canvases "Mugham", "Adam and Eve", "Old Nodding Oil Derrick" are made up of many different faces contained in small squares and they gave rise to his cycle "Faces", which professionals have hailed as a new word in artistic craftsmanship. His painting "Garnet" was sold for $50,000 at Tokyo International Art Fair. They embellish the offices of the Baltimore Sun newspaper (U.S.), Turkey’s Ministry of Defence, the Lambri International company (Holland), the Peace Foundation, the French embassy in Azerbaijan and many private collections around the world. Azerbaijani artist Vugar Muradov is also a member of the UNESCO International Federation of Art.